Constructivism was an artistic and architectural movement in Russia from 1919 onward (especially present after the October Revolution) which dismissed "pure" art in favour of an art used as an instrument for social purposes, specifically the construction of a socialist system. Constructivism as an active force lasted until around 1934, having a great deal of effect on developments in the art of the Weimar Republic and elsewhere, before being replaced by Socialist Realism. Its motifs have sporadically recurred in other art movements since. The term Construction Art was first used as a derisive term by Kazimir Malevich to describe the work of Alexander Rodchenko in 1917. Constructivism first appears as a positive term in Naum Gabo's Realistic Manifesto of 1920. Constructivism was a post- First World War outgrowth of Russian Futurism, and particularly of the 'corner-counter reliefs' of Vladimir Tatlin, which had been exhibited in 1915. The term itself would be coined by the sculptors Antoine Pevsner and Naum Gabo, who developed an industrial, angular approach to their work, while its geometric abstraction owed something to the Suprematism of Kasimir Malevich. The teaching basis for the new movement was laid by The Commissariat of Enlightenment (or Narkompros) the Bolshevik government's cultural and educational ministry headed by Anatoliy Vasilievich Lunacharsky who suppressed the old Petrograd Academy of Fine Arts and the Moscow School of Painting, Sculpture and Architecture in 1918. IZO, the Commissariat's artistic bureau was run during the Russian Civil War mainly by Futurists, who published the journal Art of the Commune. The focus for Constructivism in Moscow was VKhUTEMAS, the school for art and design established in 1919. Gabo later stated that teaching at the school was focused more on political and ideological discussion than art-making. Despite this, Gabo himself designed a radio transmitter in 1920 (and would submit a design to the Palace of the Soviets competition in 1930). Constructivism as theory and practice derived itself from a series of debates at INKhUK (Institute of Artistic Culture) in Moscow, from 1920-22. After deposing its first chairman, Wassily Kandinsky for his 'mysticism', The First Working Group of Constructivists (including Liubov Popova, Alexander Vesnin, Rodchenko, Varvara Stepanova, and the theorists Alexei Gan, Boris Arvatov and Osip Brik) would arrive at a definition of Constructivism as the combination of faktura: the particular material properties of the object, and tektonika, its spatial presence. Initially the Constructivists worked on three-dimensional constructions as a first step to participation in industry: the OBMOKhU (Society of Young Artists) exhibition showed these three dimensional compositions, by Rodchenko, Stepanova, Karl Ioganson and the Stenberg Brothers. Later the definition would be extended to designs for one-dimensional works such as books or posters, with montage and factography becoming important concepts. As much as involving itself in designs for industry, the Constructivists worked on public festivals and street designs for the post-October revolution Bolshevik government. Perhaps the most famous of these was in Vitebsk, where Malevich's UNOVIS Group painted propaganda plaques and buildings (the best known being El Lissitzky's poster Beat the Whites with the Red Wedge (1919)). Inspired by Vladimir Mayakovsky's declaration 'the streets our brushes, the squares our palettes', artists and designers participated in public life throughout the Civil War. A striking instance was the proposed festival for the Comintern congress in 1921 by Alexander Vesnin and Liubov Popova, which resembled the constructions of the OBMOKhU exhibition as well as their work for the theatre. There was a great deal of overlap in this period between Constructivism and Proletkult, the ideas of which concerning the need to create an entirely new culture struck a chord with the Constructivists. In addition some Constructivists were heavily involved in the 'ROSTA Windows', a Bolshevik public information campaign of around 1920. Some of the most famous of these were by the poet-painter Vladimir Mayakovsky and Vladimir Lebedev. As a part of the early Soviet youth movement, the constructivists took an artistic outlook aimed to encompass cognitive, material activity, and the whole of spirituality of mankind. The artists tried to create works that would take the viewer out of the traditional setting and make them an active viewer of the artwork. In this it had similarities with the Russian Formalists' theory of 'making strange', and accordingly their leading theorist Viktor Shklovsky worked closely with the Constructivists, as did other formalists like Osip Brik. These theories were tested in the theatre, particularly in the work of Vsevolod Meyerhold, who had set up what he called 'October in the theatre'. Meyerhold developed a 'biomechanical' acting style, which was influenced both by the circus and by the 'scientific management' theories of Frederick Winslow Taylor. Meanwhile the stage sets by the likes of Vesnin, Popova and Stepanova tested out Constructivist spatial ideas in a public form. A more populist version of this was developed by Alexander Tairov, with stage sets by Aleksandra Ekster and the Stenberg Brothers. These ideas would go on to influence German directors like Bertolt Brecht and Erwin Piscator, as well as the early Soviet cinema. 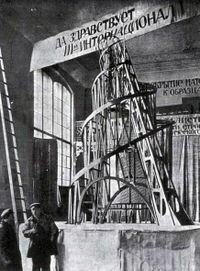 The canonical work of Constructivism was Vladimir Tatlin's proposal for the Monument to the Third International (1919) which combined a machine aesthetic with dynamic components celebrating technology such as searchlights and projection screens. Gabo publicly criticized Tatlin's design saying Either create functional houses and bridges or create pure art, not both. This had already led to a major split in the Moscow group in 1920 when Gabo and Pevsner's Realistic Manifesto asserted a spiritual core for the movement. This was opposed to the utilitarian and adaptable version of Constructivism held by Tatlin and Rodchenko. Tatlin's work was immediately hailed by artists in Germany as a revoltion in art: a 1920 photo shows George Grosz and John Heartfield holding a placard saying 'Art is Dead - Long Live Tatlin's Machine Art', while the designs for the tower were published in Bruno Taut's magazine Fruhlicht. Tatlin's tower started a period of exchange of ideas between Moscow and Berlin, something reinforced by El Lissitzky and Ilya Ehrenburg's Soviet-German magazine Veshch-Gegenstand-Objet which spread the idea of 'Construction art', as did the Constructivist exhibits at the 1922 Russische Ausstellung in Berlin, organised by Lissitzky. A 'Constructivist international' was formed, which met with Dadaists and De Stijl artists in Germany in 1922. Participants in this short-lived international included Lissitzky, Hans Richter, and Laszlo Moholy-Nagy. However the idea of 'art' was becoming anathema to the Russian Constructivists: the INKhUK debates of 1920-22 had culminated in the theory of Productivism propounded by Osip Brik and others, which demanded direct participation in industry and the end of easel painting. Tatlin was one of the first to answer this and attempt to transfer his talents to industrial production, with his designs for an economical stove, for workers' overalls and for furniture. The Utopian element in Constructivism was maintained by his 'letatlin', a flying machine which he worked on until the 1930s. In 1921, a New Economic Policy was set in place in the Soviet Union, which reintroduced a limited state capitalism into the Soviet economy. Rodchenko, Stepanova, and others made advertising for the co-operatives that were now in competition with commercial businesses. The poet-artist Vladimir Mayakovsky and Rodchenko worked together and called themselves "advertising constructors". Together they designed eye-catching images featuring bright colours, geometric shapes, and bold lettering. The lettering of most of these designs was intended to create a reaction, and function on emotional and substantive levels - most were designed for the state-run department store Mosselprom in Moscow, for pacifiers, cooking oil, beer and other quotidian products, with Mayakovsky claiming that his 'nowhere else but Mosselprom' verse was one of the best he ever wrote. In addition, several artists tried to work in clothes design with varying levels of success: Varvara Stepanova designed dresses with bright, geometric patterns that were mass-produced, although workers' overalls by Tatlin and Rodchenko never achieved this and remained prototypes. The painter and designer Lyubov Popova designed a kind of Constructivist flapper dress before her early death in 1924, the plans for which were published in the journal LEF. In these works Constructivists showed a willingness to involve themselves in fashion and the mass market, which they tried to balance with their Communist beliefs. The Soviet Constructivists organised themselves in the 1920s into the 'Left Front of the Arts', who produced the influential journal LEF, (which had two runs, from 1923-5 and from 1927-9 as New LEF). LEF was dedicated to maintaining the avant-garde against the critiques of the incipient Socialist Realism, and the possibility of a capitalist restoration, with the journal being particularly scathing about the 'NEPmen', the capitalists of the period. For LEF the new medium of cinema was more important than the easel painting and traditional narratives that elements in the Communist Party were trying to revive at that point. Leading Constructivists were heavily involved in film, with Mayakovsky starring in The Young Lady and the Hooligan (1919), Rodchenko's designs for the intertitles and animated sequences of Dziga Vertov's Kino Eye (1924), and Aleksandra Ekster designed the sets and costumes for the science fiction film Aelita (1924). The Productivist theorists Osip Brik and Sergei Tretyakov also wrote screenplays and intertitles, for films such as Vsevolod Pudovkin's Storm over Asia (1928) or Victor Turin's Turksib (1929). The filmmakers and LEF contributors Dziga Vertov and Sergei Eisenstein as well as the documentarist Esfir Shub also regarded their fast-cut, montage style of filmmaking as Constructivist. The early Eccentrist films of Grigori Kozintsev and Leonid Trauberg (New Babylon, Odna) had similarly avant-garde intentions, as well as a fixation on jazz-age America which ran through the movement, with its praise of slapstick directors like Charlie Chaplin or Buster Keaton, as well as of Fordist mass production. Like the photomontages and designs of Constructivism, early Soviet film concentrated on creating an agitational effect through Montage and 'making strange'. The Constructivists were early pioneers of the techniques of photomontage. Gustav Klutsis' 'Dynamic City' and 'Lenin and Electrification' (1919-20) are the first examples of this method of montage, which had in common with Dadaism the collaging together of news photographs and painted sections. However Constructivist montages would be less 'destructive' than in Dada. 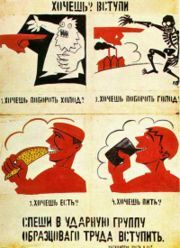 Perhaps the most famous of these montages was Rodchenko's illustrations to the Mayakovsky poem About This. LEF also helped popularise a distinctive style of photography, involving jagged angles and contrasts and an abstract use of light, which paralleled the work of Laszlo Moholy-Nagy in Germany: the leading lights of this included, along with Rodchenko, Boris Ignatovich and Max Penson, among others. This also shared many characteristics with the early documentary movement. Meanwhile LEF produced an architectural offshoot, the OSA group led by Alexander Vesnin and Moisei Ginzburg - for more information see Constructivist architecture. The book designs of Rodchenko, El Lissitzky and others such as Solomon Telingater and Anton Lavinsky were a major inspiration for the work of radical designers in the west, particularly Jan Tschichold. Many Constructivists worked on the design of posters for everything from film to political propaganda: the former best represented by the brightly coloured, geometric jazz-age posters of the Stenberg brothers, and the latter by the agitational photomontage work of Gustav Klutsis and Valentina Kulagina. The Constructivists' main political patron early on was Leon Trotsky, and it began to be regarded with suspicion after the expulsion of Trotsky and the Left Opposition in 1927-8. The Communist Party would gradually come to favour realist art over the course of the 1920s (as early as 1918 Pravda had complained that government funds were being used to buy works by untried artists). However it wasn't until around 1934 that the counter-doctrine of Socialist Realism was instituted in Constructivism's place. 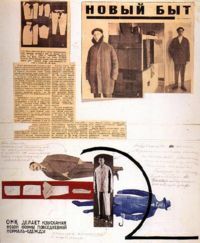 Many Constructivists continued to produce avantgarde work in the service of the state, such as in Lissitzky, Rodchenko and Stepanova's designs for the magazine USSR In Construction. 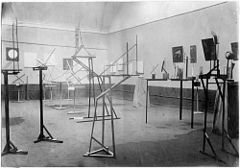 A number of Constructivists would teach or lecture at the Bauhaus, and some of the VKhUTEMAS teaching methods were taken up and developed there. Gabo established a version of Constructivism in England in the 1930s and 1940s that was taken up by architects, designers and artists after World War II (see Victor Pasmore), and John McHale. Joaquin Torres Garcia and Manuel Rendón were instrumental in spreading the Constructivist Movement throughout Europe and Latin America. The Constructivist Movement had an enormous impact on the modern masters of Latin America such as: Carlos Merida, Enrique Tábara, Aníbal Villacís, Theo Constanté, Oswaldo Viteri, Estuardo Maldonado, Luis Molinari, Carlos Catasse, and Oscar Niemeyer, to name just a few. There have also been disciples in Australia, the painter George Johnson being the most widely known. See also Constructivist architecture on the architectural avantgarde of the 1920s and 30s in the USSR. In the 1980s graphic designer Neville Brody used styles based on Constructivist posters that sparked a revival of popular interest. Deconstructivist architecture by architects Zaha Hadid, Rem Koolhaas and others takes constructivism as a point of departure for works in the late 20th and early 21st centuries. Zaha Hadid in her sketches and drawings of abstract triangles and rectangles evokes the aesthetic of constructivism. Though formally similar, the socialist political connotations of Russian constructivism are de emphasized in Hadid's deconstructivism. Rem Koolhaas' projects recall another aspect of constructivism. The scaffold and crane-like structures represented by many constructivist architects, return in the finished forms of his designs and buildings.